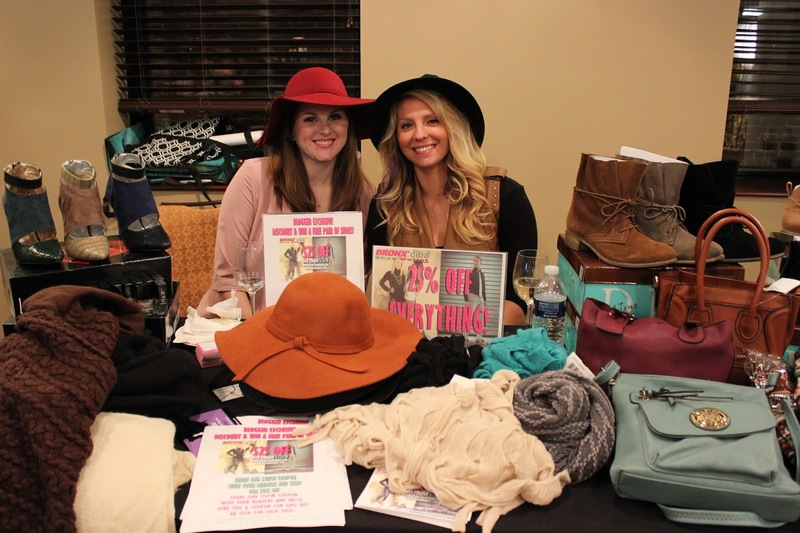 St. Louis Fashion Week is in full swing, and we're totally loving it! 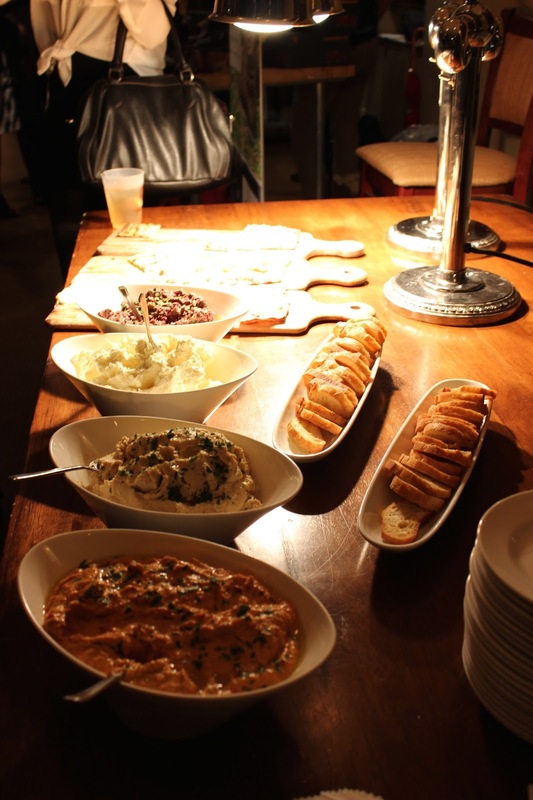 On Friday night, we headed out to Scape American Bistro in the Central West End (absolutely beautiful!) for the Well Dressed Midwest VIP Blogger Lounge. 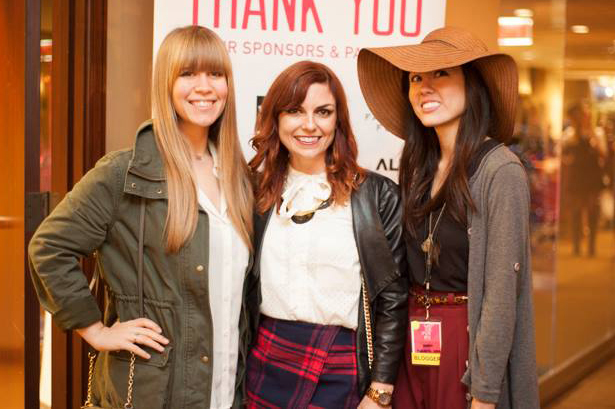 We loved having the chance to meet up with some lovely blogger friends and gear up for fashion week. 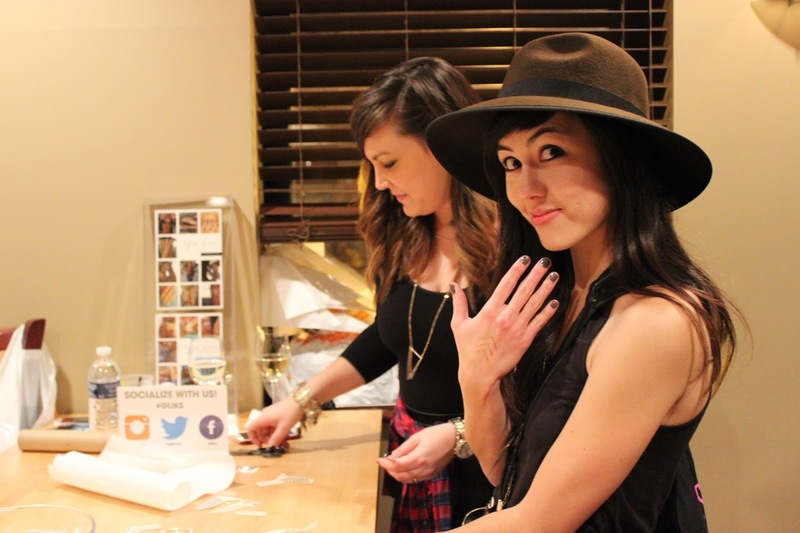 Hang on to your fashionable hats ladies and gents, this recap is a long one but so worth it! In addition to spending the evening eating delicious food (shrimp pizza that I'm still dreaming about), we were able to network with some incredible brands and do a little shopping. For each of the STLFW events, we have a great opportunity to step back and examine our own personal sense of style: what look truly represents us? 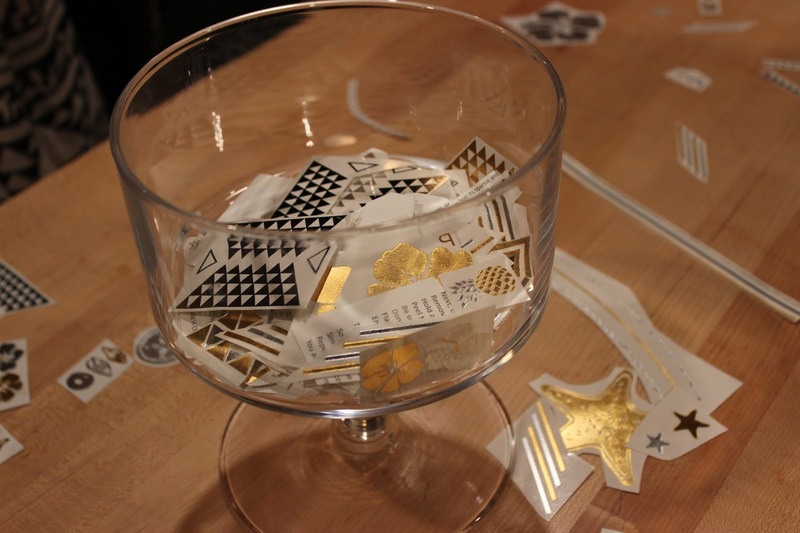 We know, you're favorite part...check out what we wore! 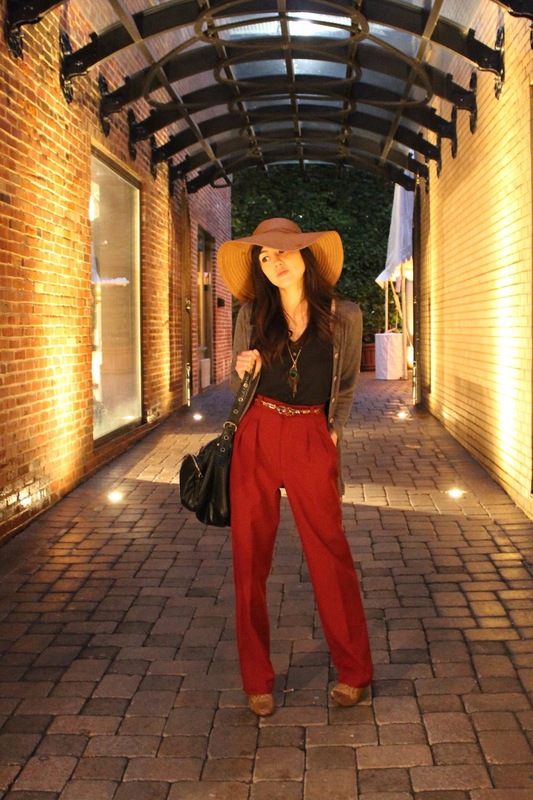 When I found these pants a couple years ago at a thrift store, I immediately fell in love with them. I thought STLFW would be the perfect occasion for busting them out for a night of mingling and perfectly feminine for a fun girls' night out. I found this hat at a flea market while in Orlando, and I thought it would help to soften the look even more. Plus, it helped for the rainy evening! 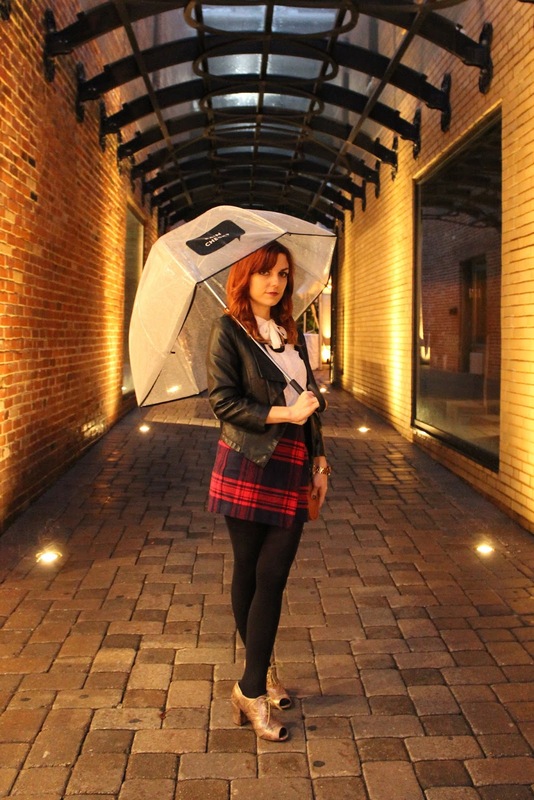 I'm a teacher by day, so I thought it'd be fun to rock the schoolgirl look at night, inspired by the runway at Saint Laurent. I've always been mad about plaid, so I loved this soft red mini. I thought it paired perfectly with my favorite Madewell menswear white button up top with a ladylike bow at the collar. My rose gold Seychelles made another appearance, and it won't be their last! We were singing in the rain in the CWE, so of course my Kate Spade umbrella had to accompany me. 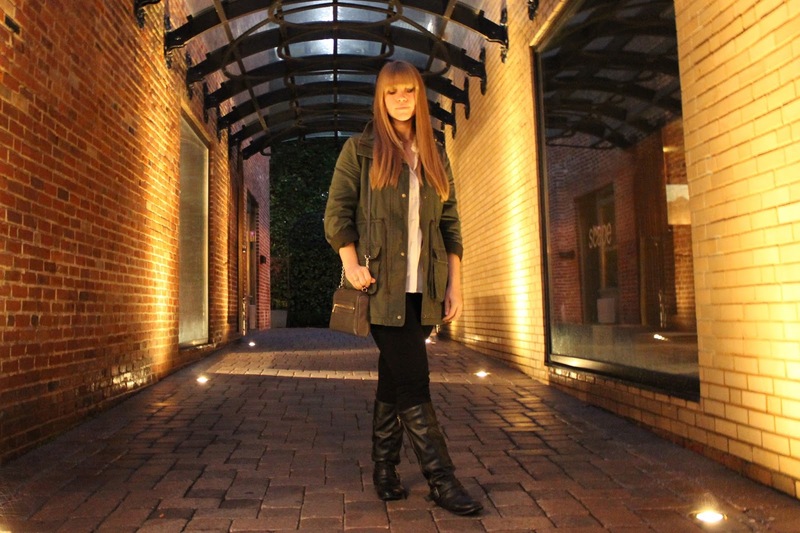 My outfit was all about rocker chic, with an edgy army green military jacket and tough biker boots. I just can't seem to get away from that rough, sassy band wife look. I love to soften my look with dainty feminine details: the flowy chiffon blouse, a delicate gold infinity necklace and my signature tiny crossbody bag. Well Dressed Midwest sure knows how to throw a party! The night was full of facetime with some truly talented local brands, and we got to pick up some great pieces for the upcoming fashion week events. How cute are the girls from Bronx Diba Shoes? Sharon snagged one of their adorable hats for a steal of a deal. We wish that we'd all gotten matching friendship hats...but maybe next time. Paula trIed on these sparkly loafers from Lookie Lou that totally captured our hearts. 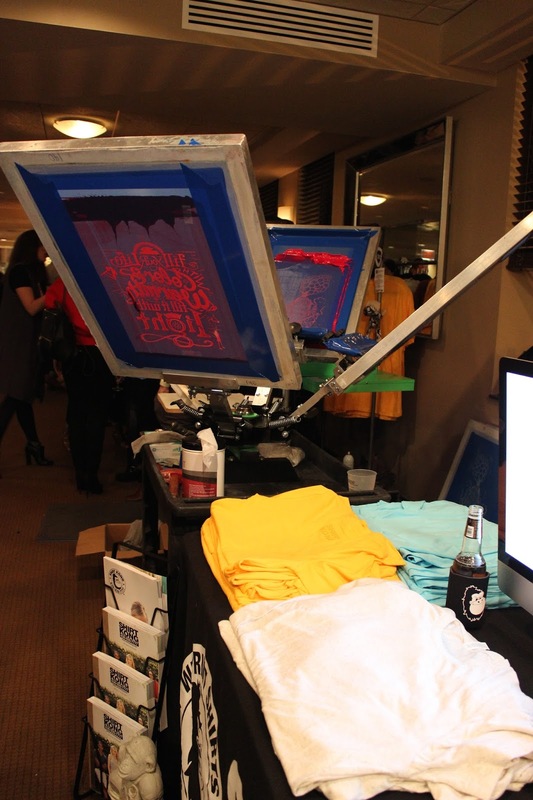 The fabulous Shirt Kong (which we HIGHLY recommend if you are in the STL area and needing some screen printing done) had a live printing press during the event. They were printing shirts in a variety of colors and design combos right before our eyes for bloggers to take home that evening. All in all, the Well Dressed Midwest Blogger Lounge was a wonderful evening. We can't wait to see what's up their sleeves for all of the upcoming STLFW events!